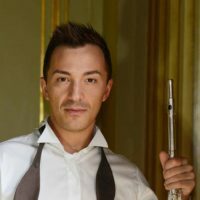 Artist, interpreter and researcher as in one, passionately keen on contemporary music, Matteo Cesari (Bologna, 1985) has played as a soloist worldwide, from Europe to China, from Australia to the United States. His musical career path has been enriched from Italy till Conservatoire de Paris and at Université Paris IV (Sorbonne), where he has obtained his doctor degree with the highest honour (congratulations from the jury) in April 2015, specialized in interpretation, research and practice, with his thesis on the interpretation of time in L’orologio di Bergson of Salvatore Sciarrino and Carceri d’Invenzione IIb of Brian Ferneyhough. Being the laureate at several other competitions, he also won the Kranichsteiner Musikpreis at Darmstadt.